Every detail receives critical attention.  The signature stay-cool handle is cast from solid stainless steel, and is ergonomically-designed for comfort during long cooking sessions. Rivets are formed from high-yield-strength stainless steel, and treated to remove trace elements of iron that could otherwise cause corrosion. 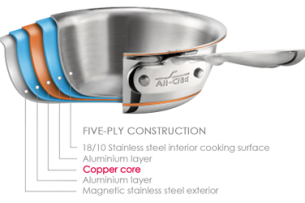 COPPER CORE features a bonded five-ply construction that combines the superior heat conductivity of copper with the cleaning ease of 18/10 stainless steel, for unrivaled culinary performance. Offering beauty of design with ultimate culinary performance, the COPPER CORE Collection is the choice of true connoisseurs. D5’s patented inner core of premium stainless guarantees more even heating performance over traditional cookware, virtually eliminating hot spots while achieving a new level of stability that is optimised for induction cooking and improves performance on all hob surfaces.  Years in development, stainless with patented d5 technology sets a new standard in culinary excellence.